Candy Makes For Wonderful Halloween Wedding Favors! It’s no secret that candy is a popular pick as a wedding favor for many couples, with ‘candy bars’ (no, not Candy Bars, but those are good, too!) outgrowing their status as a trend, and becoming a fast go-to favorite. And while we think candy is a smart favor pick for any wedding, for its deliciousness and because it simply makes people smile, there is no wedding that candy makes more sense for than a Halloween wedding! We’ve been reading quite a few fun stories about people who have been married on Halloween in the past, and those who will be this year or next. And we have to admit we can’t think of a better Halloween party than the reception of a couple who is cool enough to get married on this super fun holiday. We also love the idea that many of these couples are asking guests to come in costume, and many of the couples themselves are in costume as well. (No, not as bride and groom!) I would rather dance the night away in costume than uncomfortable heels any day! The options for decorating with candy for your Halloween wedding are rather endless, but we wanted to highlight some fun ideas for favors in this post. When it comes to choosing the candy you’ll use, you can gift guests Halloween Candy or an assortment of Orange Candy and Black Candy. Or, you can just use your favorites! Is there a candy you or your fiance favor above all others? Is there a candy that reminds you of a favorite memory? Consider selections from our Nostalgic Candy collection if candy has always been an important part of your life. The real fun comes in how you’ll give the candy to your guests. You can keep it simple but thematically spot-on by purchasing treat bags from your local party supply store, filling them with candy, and setting them at each seat. Or, you can use a pumpkin candy bucket or cauldron filled to the top with a sweet selection of treats as the centerpiece of each table and leave empty treat bags at each place setting so guests can choose their favorites. And if you want to make your guests sing for their sweets like so many trick-or-treaters will be that night, nothing gets a reception rocking quite like karaoke! Halloween Candy and Horror Movies Make a Marvelous Double Feature! The topic at Blair Candy Headquarters turned to that most glorious genre of films the other day – Horror! To be fair, I may have forced the topic to turn such a way as I am rather obsessed with scary movies and revel in my chance to talk about them more often as Halloween approaches and the masses descend upon these movies with the same zeal Horror fans have all year long. With thoughts of horror movies old and new swimming through my mind amidst the cartons of candy that are a sweet staple at Blair, I began to think of themed monster and mayhem candy/movie pairings. After all, while I do love popcorn, given the choice between popcorn and candy I’ll take a Butterfinger over buttery kernels any day! I put together a frighteningly fun list of candies that complement some of my favorite horror movies, but I know I haven’t even come close to thinking of them all. Feel free to use some of the ideas below for themed movie nights of your own, and as always, any additional ideas are always welcomed! Leave a comment on this post, Tweet Us, or share your idea on Facebook – pick your poison! The Blair Witch Project – Come on, how could we not love this movie?! We don’t want to see any comments about which lovely lady at Blair you think would win the title of The Blair Witch, but we do recommend pairing this instant classic with our creep-tastic Witch Finger Lollipops. Frightful just got fruity! The Hills Have Eyes – Whether you prefer the original or the modern-day remake (I’m going remake on this one! ), nothing will have you chewing faster while hiding your own eyes under the blanket than our Eye Gumballs. Henry: Portrait of a Serial Killer – When the movie credits for the film on IMDB.com feature a role for ‘Floating Woman’, you know it’s a scary movie! This flick is certainly not of the campy horror variety, and it’s going to take a seriously delicious candy bar to make it through. The only option? Oh Henry! Killer Klowns from Outer Space – I can’t recommend this movie enough. It may not have won any Oscars, but I make sure to watch it as least once every Halloween season. As for a complementary candy to nosh on, Cotton Candy all the way! Children of the Corn – Do I even have to say it? Candy Corn, of course! Isle of the Snake People – We can’t tell you the secret identity of Damballah, but we can tell you that our Giant Gummy Snakes make for a long-lasting and delicious snack sidekick to this Boris Karloff film. The Bone Collector – How many times have I said, “Why collect bones when you can eat them?” Too many! And every time I was talking about Crazy Bones Halloween Lollipops. Pinkie bone swear! Dracula – Everyone has their favorite Dracula – and their favorite vampire movie, for that matter. I won’t pretend to know which is best for everyone, for each has its own reasons for reaching #1 on someone’s list. All I can say universally is that Wax Fangs make watching each and every one of them even better. 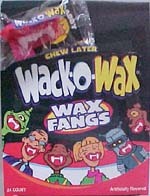 And if there’s anything my friends will tell you about me, it’s that I don’t lie about Wax Fangs! Let The Trick-or-Treater Decide Whether It’s Candy Time Or Time To Run! While it has been quite a few years since my costumed self took to the Trick-or-Treating streets with a candy bag in one hand and a whole lot of hope to fill that bag in the other, the memories of my trick-or-treating days are as fresh now as ever. I have always loved Halloween – everything about it. Even as a young child who was often afraid of the simplest things, the scares of Halloween did nothing but delight and excite me. But for all the haunted houses and hayrides that I enjoyed throughout October, nothing could even come close to Halloween night itself. And I’m thankful for every adult that let themselves be a kid for the night and tapped their creativity to come up with fun and frightening ways to make Halloween all it could be! Anyone who has gone trick-or-treating knows that not all houses you’ll visit are created equal. It is true that as long as treats are being given, no house is a bad house! But some are definitely more memorable than others. There are the houses with super sweet older people who are so excited by all the kids’ costumes, and make you feel all warm and fuzzy and happy for having stopped by. There are the houses with a loudly barking dog who probably only wants to make new friends, but whom you’re convinced wants to eat you! And then there are the Halloween Houses. The houses that fill you with a fear previously unknown, as creepy music pours from front porch speakers or open windows, and you’re forced to dig deep down into your 9-year-old soul and decide if getting the candy is worth the risk. The fact that you can’t miss out on this house that all the kids will be talking about tomorrow at school quickly couples with the fact that candy is ALWAYS worth the risk, and you and your friends walk a little more slowly than usual toward a house you don’t realize at the time you’ll remember vividly for probably forever. Knocking on the Devil’s Door: Whether you’re 8 or 88 years old, the Devil is a frightening creature. If you aren’t comfortable with using Devilish motif, any monster will do! This idea brings in the fun of the timeless game show opportunity to choose Door #1, Door #2 or Door #3. For the actual doors you can use old doors you might have laying around in the garage, or just doors made from cardboard boxes. Be sure to decorate them to be extra Halloween-y! Behind one door will be a simple Halloween treat, perhaps a pair of Chocolate Eyeballs staring back at the child who dares to open the door! Behind another door will be an even better candy gift, like a Halloween PEZ Dispenser or small sack filled with Halloween Candy. And behind the final door? A friend or family member dressed to terrify. Bwahaha, Halloween is awesome! If you want to be nice after scaring an unsuspecting child halfway out the door in a single jump, giving them candy anyway can go a long way to making things better. Give the Illusion That You Aren’t Home: I’ll never forget the day a neighbor nearly caused my little kiddy heart to stop by pulling the ‘we aren’t home’ trick. They had left their front porch light on, an indicator in my neighborhood that this was a Halloween-friendly house with candy to be given, but when my friends and I got to the door, there was a note taped to it apologizing that they were out of town, but still wanted to give the neighbor kids some Halloween Candy. The note directed us to the far end of the porch, where a ‘Halloween dummy’ was propped up in a chair holding an oversized bowl of Fun Size Candy Bars and more. In short, our eyes grew wide as we stood in awe at the freedom to choose our favorites. The only catch? As soon as we reached into the bowl, the ‘Halloween dummy’, aka. our very cleverly dressed-up neighbor, came to life and grabbed our hands causing what may have been the loudest screams ever to have been screamed. In the end, we got the candy we wanted and lost about 7 years of our lives. For a Halloween fan like myself, this is still considered a Hallo-win! Incorporating Candy Into Your Halloween Costume For A Unique Look That’s Right on the Money! I can’t speak for the whole Blair Candy family, but for me, Halloween season is truly the happiest time of the year. Some might argue that fall is actually the season, and Halloween just a day in the fall. 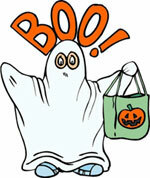 But I feel that all the splendors of fall are more a part of Halloween than Halloween a part of them. I love it all – every fallen leaf, every motion-activated monster decoration, every delicious bite of Jello eyeballs. Sipping apple cider while waiting in line for a hayride wearing an old sweatshirt and feeling butterflies in my stomache anticipating the haunts ahead – this is my idea of the perfect moment in the perfect season. And with fall (aka. Halloween Season!) being the most fleeting times of year in the Northeast, it is of the utmost importance to treasure every day before the first flakes of winter make themselves known. Counting myself among the most dedicated candy fans I know, one might reasonably assume that candy is my favorite aspect of the Halloween season. But it’s not! Don’t get me wrong – I love Halloween candy. And I think it’s absolutely amazing that it can be had for free with a simple knock on the door! But it is Halloween costumes that have the highest position in my Halloween heart. And making my own Halloween costumes, for all my crafty shortcomings, is something I enjoy to the fullest, for this is a craft where creativity trumps flawless execution. If you’ve never created your own Halloween costume, I ask that you at least consider giving it a go this year. It doesn’t matter if you aren’t a skilled seamstress, or if it takes a few tries to get the hot glue gun to actually work, this is about fun and imagination! It’s about making something memorable that reflects your personality, and this is possible no matter who you are and what your interests. Need a few ideas to get the creative juices flowing? Here’s a couple that are more awesome and affordable than anything you’ll find at the costume shop that also include clever use of candy! Piggy Bank Costume – Like most costumes, there’s more than one way to make this work, so feel free to take the general idea and make it your own. If the weather will be colder on Halloween night in your town, consider using a pink sweat suit as the foundation for your bank. If it will be warmer, lightweight pink pants and a pink tee will work as well. The only supplies you’ll need for the majority of the costume are a marker and some sort of adhesive. The marker will be used to write ‘Piggy Bank’ on the front of your costume, and to draw a coin slot on the back. These steps are optional if you’d like your costume to be a bit more of a mystery. Apart from a piggy mask – which can be purchased from a party store or made from fabric, foam, cardboard or any number of materials – the only additional component is Bubble Gum Candy Coins or Chocolate Coins. If you’ll be celebrating Halloween somewhere cooler, either should work well. If it will be warm, bubble gum coins will likely be your best bet. Use your adhesive of choice to affix the coins to your sweat suit, ensuring at least one is stuck near the coin slot on your back ready to drop in! If you want people to be able to enjoy the candy or gum on your costume, double-sided tape should work well. If you want to keep the candy on your costume all night and don’t plan to eat it, fabric glue might be a better solution. Just keep in mind that this costume is more likely than not to be a one-season solution, as it will be difficult to wash with the glue and/or tape residue. However, we encourage you to think of something fun and fresh each year, so that will only force you not to rely on last year’s costume next year! Just buy your sweat suit from a discount store, and the whole costume should cost you less than $25. Money Tree Costume – Continuing with the money theme comes the money tree, a simple but fun costume that answers a resounding ‘Yes!’ to the favorite rhetorical question of moms everywhere, “Do I look like I’m made of money?” For this costume, like the last, we are providing the ideas to spark your imagination, but encourage you to add your own special touches to really make it shine. Start with brown sweatpants and a green sweatshirt, and pick up some fabric leaves from your local craft store. If you want to save some time, see if the store offers leaves that are strung together, connected by small plastic loops. If so, you won’t have to use as much glue as you can wrap the leaves and only add glue as needed to keep everything together. Again, you’ll need an adhesive, and if you were able to find strung together leaves, regular tape should work quite well. For the ‘money’ aspect of your money tree you’ll need Jumbo Money Lollipops, strawberry lollipops with a bubble gum center whose wrapper resembles American dollars. Simply attach the sticks of the lollipops to the plastic spacers between leaves with the tape, letting them dangle like fruit from a tree. Space them out as much as you’d like, and decide ahead of time if you’ll be letting people ‘pick money’ from your tree. If so, don’t tape them too tightly. If not, be sure to bring some extras along so temptation doesn’t get the best of them! Do you have any homemade costume ideas to share? We’d love to hear from you in the comments!